The Kiddy Guardianfix Pro 2 is a forward facing Group 1/2/3 child car seat, which grows with the child to ensure a perfect fit at every stage of their development from toddler to teenager (9kgs to 36kgs; approx 12 months old to 12 years old). The Guardianfix Pro 2 is based on the award winning Guardian Pro 2 with its outstanding safety and comfort features. However, the Guardianfix Pro 2 can also be fitted into a car with or without the ISOFIX connectors to ensure an extremely secure fix. This excellent car seat has passed strict safety tests by ADAC, Stiftung Warentest, Which? and ÖAMTC. 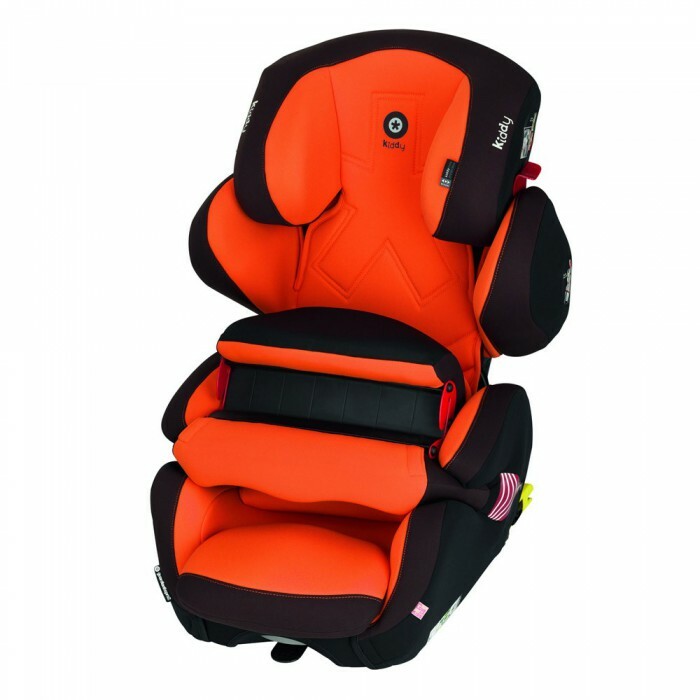 The Kiddy Impact Shield fits quickly and easily into position on a young child using the adult 3 point seat belt, thus there are no difficult harness straps to adjust as the child grows. The impact shield is designed to protect the upper part of a child’s body from severe injury in the event of an impact. High-tech materials have been used to give impressive side impact protection to the head and shoulder area. These absorb energy to protect a child from the force of a high impact. An older child will require the adult 3 point seat belt but the height and width can be adjusted quickly with one hand as the child grows up. An adjustable padded leg support gives good support and depth for even the oldest of children to sit comfortably. Kiddy car seats are approved by TÜV Rheinland and the Federal Aviation Authority for use in aircraft. After the flight and on holiday, you can also use the child seat in a rental car and so there is no compromise on safety for your child.